Hand Signed, Copyrighted, and registered at the U.S. Library of Congress. Certain Places connect us to loved ones and special experiences as nothing else can. in London I had my ultimate island experience. 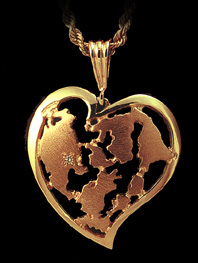 detailed "Heart of the Islands" ™© pendant, earrings, or charm. We include a custom set diamond highlight at your home site, mooring, or favorite destination. Hand signing each creation adds the perfect finishing touch to a cherished gift that will be treasure for generations to come. Information: For our Heart of Orcas, Lopez, Shaw, Fidalgo, Bainbridge, Henry, Decatur, Whidbey, and other island creations call 1 800 234 5078. Our customers are always on the lookout when they travel for something truly unique. Our "Heart of the Islands" ™© speaks to the specialness of your time in the islands. Jewelers Vigilance Committee -- the industry's guardian of ethics and integrity. From their studio overlooking Friday Harbor designer goldsmiths Dan and Diane Levin enjoy an enthusiastic international following. The exquisitely detailed designs they create stand out among the classics of fine jewelry design the world over. Dan Levin original designs are copyrighted and each individual creation receives the Levin signature hand engraved by the artist. Hours will vary -- Call ahead if you are making a special trip.